I love this detergent. 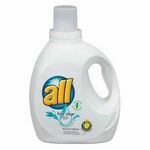 All Free & Clear is the only detergent I will use due to very sensitive skin. Excellent price point for an awesome detergent. An affordable and effective laundry detergent is hard to come by. I appreciate that while using this product I am not pouring watered down soap into my machine. I would definitely be buying again!! My go to detergent for my son that has sensitive skin, it's the only brand I use for him. This is the only detergent that I buy! Both my husband and myself have very sensitive skin and allergies to strong fragrances. We also have a baby at home and I am a little worried with using too much scents and chemicals on his stuff. 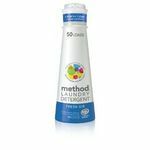 I have used the liquid and the pods and they both work really well to get your clothes super clean, absolutely love it. Really gets your clothes clean! 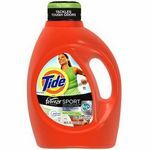 I use this detergent washing our clothes and it really does a good job . My son has sensitive skin and this detergent doesn't make him itch or anything. I just love this detergent. It doesn't have a bad smell either. I choose this over other name brands. Also the price isn't bad. The clothes washed in this detergent came out smelling fresh and seemed to clean well. Once I poured directly on a small light stain and after the load washed, you could not see the stain. If I purchase a large detergent, I end up putting it in a smaller bottle so it's easier to lift and use. This bottle is perfect size. 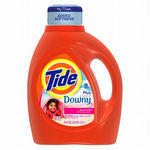 The cost is a little more expensive then some other less known name brands, but the detergent cleans better and you also tend to use less liquid. I love the smell! it's just a nice fresh, clean smell. It leaves my laundry soft. I love All! This is by far the best laundry soap! The first one I've used that doesn't break my kids and myself out. We have very sensitive skin! 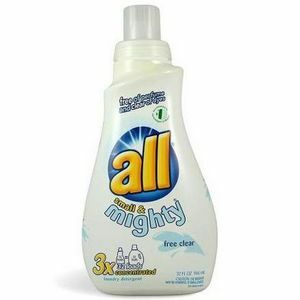 I have been buying All Small & Mighty laundry detergent lately because Tide is getting to be ridiculously priced. I have found that not only is All cheaper, but you get to use less of it than most other brands and yet it still gets clothing cleaner as other detergents in it's price range. I have been buying All Small & Mighty Free Clear Liquid Laundry Detergent because it doesn't have loads of perfumes and dyes in it. I don't know why you would put dyes in detergent because dyes are usually bad for skin. This is perfect for those with allergies, skin breakouts, and even those with acne. If you have acne and have tried everything to get rid of it, then I suggest using a different laundry detergent because the perfumes and dyes can aggravate acne prone skin. Performance It really gets the dirtiest clothes clean and you don't even have to use very much. I use half a capful of All to get a large load of laundry clean. I have three teenage children, and it does a wonderful job at getting their dirty clothes clean. It may not work as well as Tide, but it's still better when you consider it's a little cheaper. I usually soak stains, and this works just as well as using Tide, anyhow. Scent It has absolutely no scent, it doesn't even have a chemical smell. It just smells like a nice clean soap. It's also a great detergent for those with babies, as they usually have the most sensitive skin. 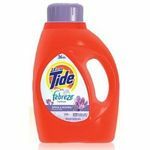 My entire family has very sensitive skin and it is hard to find a detergent that is kind to our allergies. All Small & Mighty Free and Clear not only cleans our clothes, but doesn't react to our skin. Performance We are a tough family on clothes. My children are both athletes, my husband works with oil and grease, and I am a teacher who seems to come home covered in goodness knows what from my day with the kids. Even Expo marker comes out easily with All, and those stains seem to be everywhere on me at the end of the day. I also really like the fact that it is very concentrated and I only need to use a small amount. It not only saves space in my laundry room, but it saves a lot of money. The Sunday paper frequently has coupons for All which makes this a great way to keep an active family clean without breaking the bank. Scent Love the fact that the only thing is smell is clean laundry. No perfumes or strange scents to react to our skin or make the men in my family smell like roses.